We stock online a range of Hockey Balls which are suitable for training and matches. Including both dimple and smooth hockey balls you can select from a wide range of colours, so you never lose your ball under the floodlights. There are many different manufacturers of hockey balls who produce balls with different textures and feels which can imfluence performance on the pitch. 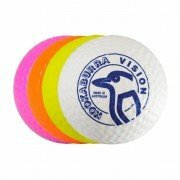 The brands we stock include Grays and Kookaburra with the Kookaburra Dimple being one of the most popular products. Throughout the season we stock different types of hockey balls including match balls, training balls, indoor balls, smooth balls, dimple balls, coloured balls and lightweight balls. 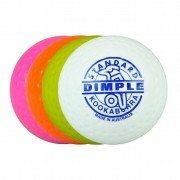 Dimple hockey balls are the most commonly used and was originally designed by Kookaburra for use on water based pitches, its design allows the ball to run smoother and faster on the water based pitches. Many UK pitches are actually sand based astro turf and smooth hockey balls actually perform better for this surface. Hockey balls can come in a variety of colours all of which can impact play dependant on the lighting for example white hockey balls can be difficult to see under floodlights as can yellow. Pink hockey balls have started to be used more on the blue pitches as they stand out more for both players and spectators. Most hockey balls have been made with a hollow core so can break apart over time and in cold conditions. Hockey balls also wear over time especially when used on sand pitches, remember no product lasts forever.